Those of us who lived through that horrible night will never forget—and we hope that others will be prompted to remember the date of June 9, 1972. The morning of June 9th dawned with a humid and foggy haze covering much of the eastern Black Hills and plains to the east. That hot, humid Friday in early June eventually turned into a night that Black Hills residents would never forget; a night in which over 238 persons would not survive. A large area of very heavy thunderstorms formed throughout the afternoon and evening in the same area, and the resulting torrential rains continued for hours. Some points in the Hills reported upwards of 16 inches of rain in a matter of hours, and the churning waters began to plunge down every draw, watercourse, and creek in the central and northern Black Hills. Far more stories of terror, destruction, wonder, and courage were created that horrific night, and in the days that followed, than can be told here. But, the collision of awesome natural forces and the resiliency of human faith and spirit are a continuing testament to the strength of both. The loss of life was enormous—238 lives were lost in Rapid City alone, with Keystone, Hermosa, and Sturgis also reporting lives lost. Property damage in the region was estimated in the hundreds of millions of dollars. In the aftermath of the disaster, residents rose to the occasion and rebuilt their lives and their cities. Memorial Park now occupies a central location in the heart of Rapid City, which had been devastated by the flood. This park, adjacent to the Rushmore Plaza Civic Center, is the centerpiece of a public greenway that extends the length of the city along the banks of Rapid Creek. This open space is fitting tribute to the victims, their survivors, and the heroes of this terrible event in the history of the Black Hills region. We invite you to learn more about the 1972 Black Hills Flood at the National Weather Service. 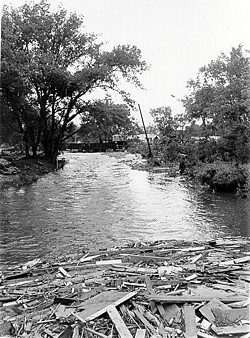 Also, for a comprehensive look at The Flood please visit the “One Night in June” – Phase I of The Black Hills Flood of 1972 Permanent Exhibit at The Journey Museum in Rapid City. You may also visit the Rapid City Public Library for a collection of interpretive materials and oral histories related to The Flood of 1972.